With Spring Break nearly upon us, students and instructors are looking forward to time off from classes and work. However, with the occasional snow day and sick day in January and February, some courses may have a bit of work to make up during the break. A simple and straightforward tool for instructors to use is the ‘Discussions’ feature in Canvas. Discussions are what they sound like: a board allowing a course’s instructors and students to interact with one another on a given topic. There are two types of Discussions: Focused and Threaded. Focused Discussions begin with the instructor making a introductory message, with individual responses made by the students below. Focused Discussions are useful for single-post discussions, answering a single question or prompt, collecting results, or sharing resources among students. An example of a Focused Discussion (image courtesy of the Canvas Guides). Threaded Discussions are started like Focused ones, but from there, they allow an unlimited amount of responses to the original prompt (as well as other responses). They are useful for long and nuanced dialogues, or for multiple questions/prompts. 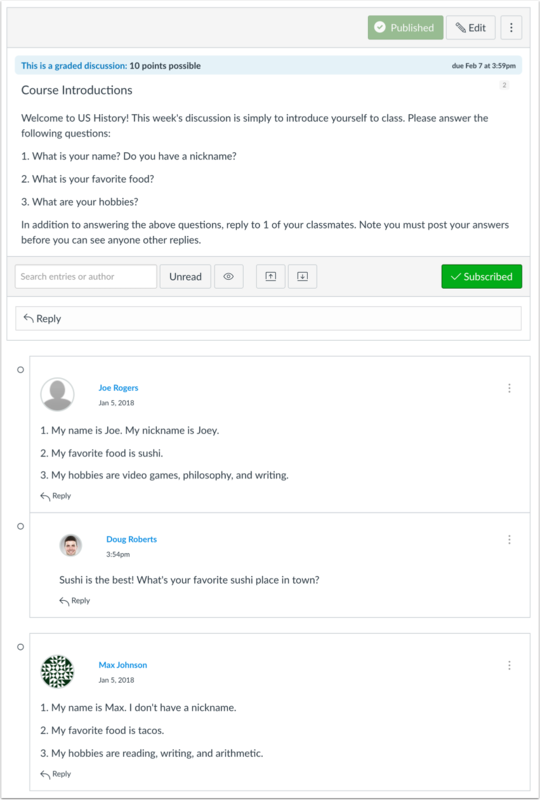 It also is better for allowing students to converse topics amongst themselves, rather than simply responding to the instructor’s post. An example of a Threaded Discussion (image courtesy of the Canvas Guides). 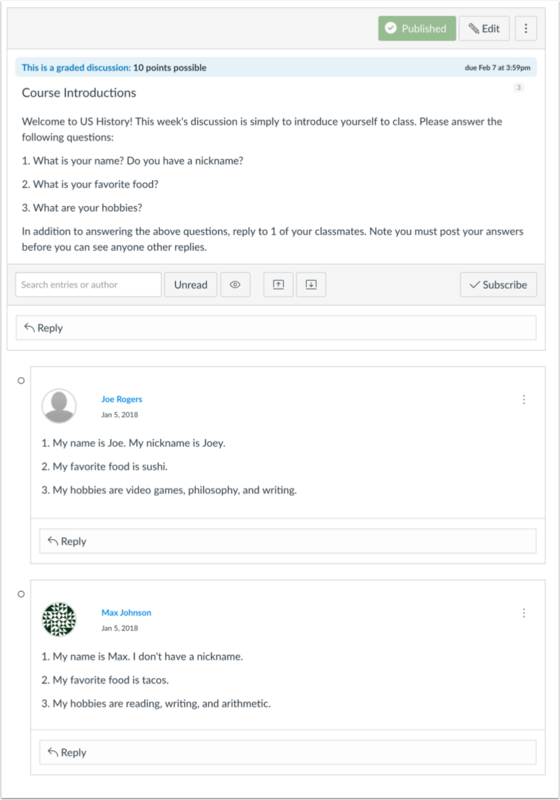 If you have any questions on Discussions, or other features in Canvas, contact the DEC at dec@longwood.edu or 434-395-4332.